Whole foods are a valuable part of the human diet, yet we seem to eat less and less of them over time. Put simply, whole foods are foods in their least-processed form. Think vegetables straight out of the garden or an apple right off the tree. Of course, not all of us have a full orchard in the backyard, so we have to make do with what we have. When shopping for groceries, focus on ingredients that are as close to their natural form as possible. That’s fresh fruit and vegetables, simple condiments like vinegar or homemade salsa, no-salt-added beans, lentils, rice, and whole grains. For the most part, avoid packaged foods. If in doubt, check the ingredient list: the fewer the better. Many packaged foods have salt, sugar, and oils added, which is what we’re trying to avoid. While cooking with whole foods might not seem as convenient as food out of a packet, it’s not as complicated as you may think. Here are some family-friendly whole food recipes that you can whip up in your kitchen. Whole-food breakfasts with a balance of protein, fat, and carbs will keep you energised all morning. Here are two recipes to try. The best thing about overnight oats is that you can make them in advance, saving you time in the morning. Overnight oats are also extremely versatile, so you can make them to your preferences. Combine ½ cup of oats in a jar with a tablespoon of chopped almonds and a sprinkling of pepitas and chia seeds. Cover with a non-dairy milk like almond or coconut, then leave in the fridge overnight. Transfer to a bowl in the morning, stir, and top with your favorite fruit. Makes 1 serving and can easily be adjusted to make a family-sized portion. Substitute your preferred nuts and seeds as desired! This easy omelette takes minutes to make and only has three ingredients: mushrooms, spinach, and eggs. For one omelette: whisk two eggs and finely chop two mushrooms. Pour the egg mixture in a nonstick pan over medium heat and sprinkle mushrooms on top. Add a handful of baby spinach. When the egg is no longer runny (about 2-3 minutes), fold the omelette in half. Cook for 2-3 more minutes, flipping once. Serve over whole-grain toast with a pat of butter. You may not be able to please everyone when it comes to lunch and dinner, but you can certainly try. One way to do that is by using customisable recipes that can be adjusted to taste. Here are a few ideas to get you started. Quesadillas are an easy crowd-pleaser. Omit or add ingredients as you go; each family member can even make up their own. The trick to keeping the recipe whole-food-compliant is in the tortilla. Look for tortillas with a short ingredient list—flour, salt, and water—or make your own. Fill your tortillas with beans, veggies, and chicken if desired. Fold in half and fry for a few minutes on each side. Slice into three and top with chopped avocado and shallots. Like overnight oats, the potential variations with buddha bowls are endless, making it easier to find a combination that the whole family will love. Whizz two avocados + a squeeze of lime in a food processor. Thin with water until it reaches a sauce-like consistency. Add salt and pepper to taste. Mix it all in individual bowls and top with avocado sauce. For more buddha bowl recipes, check out the 30 Best Buddha Bowls from Yummy Mummy Kitchen. That’s right, we said burgers—but probably not the way you’re thinking. Drive past Macca’s and expand your horizons by creating whole-food burgers at home that are still bursting with flavour. For a quick weeknight meal that uses up extra veg, it’s fritters to the rescue. With a few tweaks, these little pockets of goodness can be made with whole food ingredients. Once you get started with whole foods, packaged meals will be a distant memory! 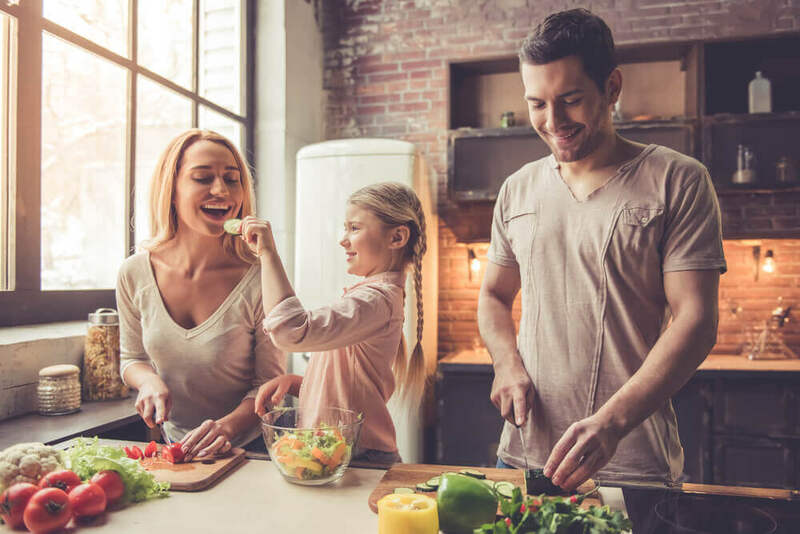 If you’re looking to improve your diet and eat more nutritious meals as a family, whole foods are an excellent place to start.